Should Amazon Expansion Slow Down to Make More Money? Amazon has become notorious for being a company that continues to thrive despite being unprofitable. Like many big-box retailers, however, Amazon utilizes the practice of discounting some products but not others. The thinking is that the discounted products will draw customers in and once they’re in, they’ll buy other items. But overall, Amazon’s profit margins continue to draw speculation. Yet instead of finding ways to increase those margins, the company seems to spend most of its attention on growth. Amazon’s reputation for unprofitability is actually deceiving. The company is profitable in some areas, notably its “other” category, which includes Amazon Web Services (AWS). Like many big-box retailers, Amazon makes up for its loss in profit in one area by earnings in other areas. It’s this philosophy that has allowed many businesses to survive for decades. By becoming a recognized name, Amazon has been able to draw customers in for its AWS cloud hosting services, allowing it to become the fastest-growing software business in history. Amazon, of course, could make changes that would boost profits on each item sold. However, in an era where customers frequently compare prices while shopping online and in stores, such a move would likely hurt the company. 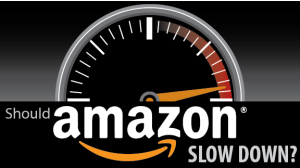 Customers often choose to shop with Amazon because of the site’s competitive pricing, sometimes even skipping price checking elsewhere based on having gotten the lowest prices so frequently in the past. To increase those prices means losing that loyalty to other companies, who might be more than willing to beat the online retail giant’s prices. In the discussion of Amazon’s profitability, one essential detail that is often omitted is its highly-successful subscription program. For just $99 a year, members can get free shipping on eligible items and members-only perks like TV streaming and free Kindle books. In addition to the recurring revenue these memberships bring in, members also have a loyalty they might not otherwise have. Prime members shop 50 percent more frequently on the site, one expert says, allowing Amazon to make up for any losses it has due to discount pricing on the items it sells. Amazon’s lack of profitability seems to be more concerning to outsiders than the company itself. For two decades, the site has operated on a revenue model of its own choosing, disregarding statements by naysayers in favor of continuing to do things the way it knows works best. If Amazon expansion continues to focus on what it does best, it will likely be able to continue to retain customers. No matter what, Amazon is here to stay, and whether you agree with it or not, they have a low price pricing strategy. So how can other retailers keep up with Amazon? PriceManager provides the solution to be able to track Amazon as well as other competitor websites, to ensure that you are staying at a competitive price and can make that sale.